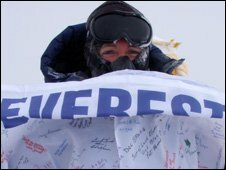 She achieved this last month by making it to the summit of the world's most famous mountain, Mount Everest. Climbing Mt Everest is a challenge for anyone - even if they are young and in the peak of health - but the 53-year-old from Wisconsin is the first person with MS ever to reach the summit. "I ran away, I was fearful of what I thought I was losing in my life," she said. "I didn't want people feeling sorry for me. I was doing plenty of that for myself at that point, I was feeling like my physical life was over." "For 20 years I taught children: 'Don't be afraid, take a chance, try', and when I was doing these climbs trying to climb the highest peak on each continent, I thought I'll do them all but Everest, because that's too hard for me." "When I got diagnosed I thought: 'Just don't be afraid to try, do the things in your life that maybe you dreamed about'." Three years ago she climbed the highest peak in North America - Mount McKinley (also known by its native American name of Denali) in Alaska. 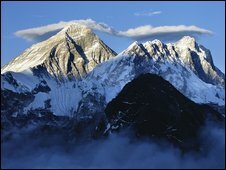 After Everest, Asia's highest peak, and Aconcagua, South America's highest peak, it is the third highest of the so-called "Seven Summits". 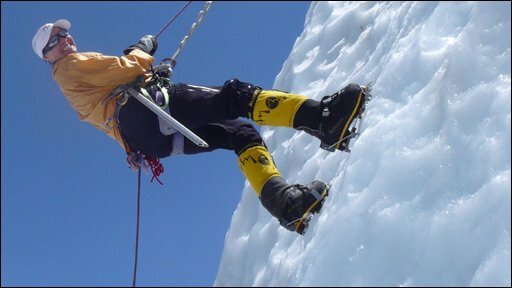 To climb Everest, the cost was financial, rather than physical - she used all her savings, sold her home and took out a loan. "I've been very, very fortunate the last several years. My MS has been pretty stable and quiet in my system," she said. "I think the real hardship on Everest is maintaining a positive attitude for two months." In achieving her goal, she has joined some of the world's most accomplished climbers and bested many others. "It was very surreal, you couldn't see anything [because of the blizzard], so I couldn't see the beauty that surrounded me." "We had to rush down so fast, but I did get a chance to give my father a call and yell: 'I made it, I made it'." "It wasn't until the next morning when I woke up in my tent after climbing for 17 hours the day before, and then all of the sudden I thought: 'Oh my gosh, I just climbed Mt Everest yesterday!'." "Who you are inside... that's what's important. That will always be there," she said. "Whether my legs carry me up a mountain or not, I'm still who I am deep inside."